As I approach the completion of Box Van's workshop, I am better able to make a final decision on the optimal space division between my living quarters and the workshop. My original estimate was 98" front to back for my living quarters. Now, however, I see that I may be able to increase that 98" to perhaps 110" with no impact on the usefulness of my workshop! I've just returned from Home Depot with the material to make the tall cabinet that I Blogged to you about yesterday. The back of this tall cabinet will be a pegboard. Also, the drawer cabinet that is mounted to the opposite Box Van wall now has material for a top. 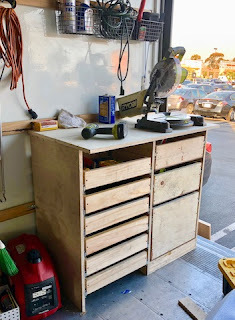 I've just completed my 9-drawer workbench. Well, it's really not completely finished yet. But you get the idea of it. Yet to come are drawer fronts and pulls. Also, a clear finish. I just bought a Ryobi sander to help me with the finishing [Link]. George that is great news. Keep up the good work. It makes sense to devote most of the space to the area you will use the most. How are you going to handle the roll-up door encroaching into your living area when opened? A false ceiling? In my mind, my living quarters inside Box Van always had its own ceiling and it's own roof. I am guessing that the ceiling would be about 6 feet high. You are incredible! So handy with everything. Tools are a key factor though, aren't they? Great job! I had the good fortune during my lifetime to be taught how to use all manner of shop tools. My Dad and Uncle both had machine shops, and I worked for both of them. I also worked for 5-years in a cabinet shop. I have repaired plumbing. Did carpentry work. I am having such a good time with my Box Van project! The thing that I like best is, for example, if I need more drawers, I simply make more drawers! That is such a great compliment! Don't forget drawers stops,,,take a nice right-hand turn,,Guess what comes flying out?